Comfort food like Creamy Chicken Pot Pie is always a winner at our house. Dinner doesn’t get any easier than this, with ready-made pie crust and rotisserie chicken. This homestyle chicken pot pie recipe is super simple and perfect for a weeknight meal. Fall came tapping on our door the other day! I had all the windows open, while I enjoyed the crisp cool air that filled the house. I actually had to put on a sweater and socks and started to close some windows, when I decided it would be the perfect time to crank up the oven for a little bit of comfort food for dinner. This creamy chicken pot pie is so easy to make and 4 time saving ingredients makes it great for any weeknight feast! Now of course if you have time, you can always make a fabulous pot pie from scratch, but if you want fast and delicious you can make that happen with a rotisserie chicken from the grocery store, refrigerated pie crust, and frozen vegetables! See? Really painless I tell you! It took me all of 10 minutes to pull apart the chicken, and heat everything in a skillet, pour it in a pie plate, and top it with the refrigerated pie crust! Toss it in the oven for 30 minutes while you make a salad and set the table and dinner is ready! My husband wont usually eat something like this, he’s not a casserole lover, but to my surprise, he not only ate it, but actually enjoyed it and ate leftovers! SCORE!! This will definitely be showing up on our regular dinner rotation! This would also make a great turkey pot pie when you are looking for ways to use up left over turkey after Thanksgiving! or how fun would it be to make autumn leaf hand pies! ooooh, I may do that next time! UPDATE: the cooking creme is no longer available and the recipe below has been updated. Warm chicken in large nonstick skillet on medium heat 3 to 4 minutes, stirring occasionally until chicken heated through. Add vegetables; cook 1 to 2 minutes. Stir in condensed soup; spoon into 9-inch pie plate. Cover with refrigerated pie crust; seal and flute edge. Cut several slits in crust. Place pie plate on baking sheet. Bake 25 to 30 min. or until golden brown. 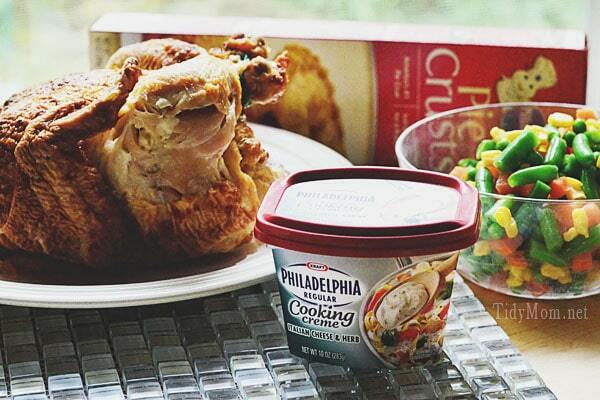 Disclaimer: I was selected by Kraft Foods to participate in the Philadelphia Cooking Creme recipe program. While I have been compensated for my time, my opinions are my own, and I have not been paid to post positive comments. I haven’t tried these but I keep meaning to throw them in my cart. Looks great! I love pot pie, makes me think of fall. 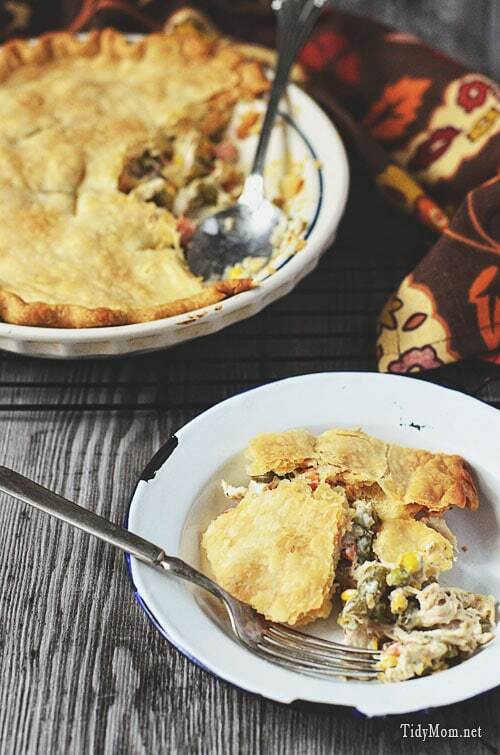 I need some chicken pot pie right about now…The perfect fall meal. I love how you used the cooking creme! This looks so wonderful and comforting, Cheryl! Mmmm…this looks delicious!!! Such comfort food for fall. And I love those cooking cremes! This is the best kind of meal–it looks super involved and labor-intensive, but it’s easy peasy! Oh Cheryl, that is one pretty pie! The cooking cream is an excellent addition. I just found what I am making for dinner tonight! Fall hasn’t tapped on the doors in SoCal yet. 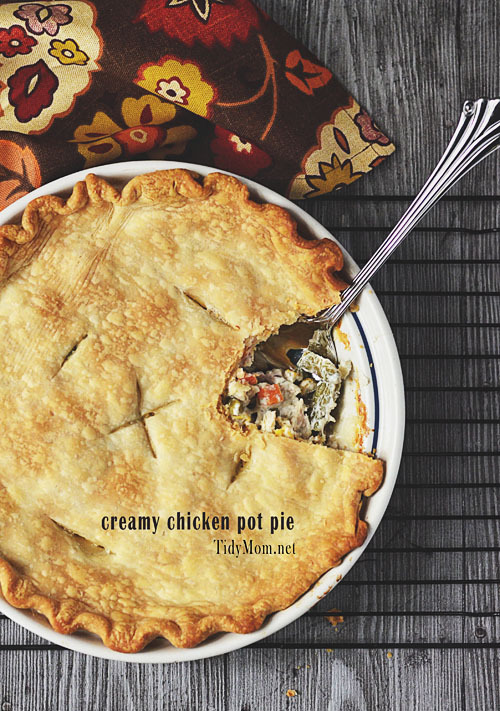 When it does, I am making this chicken pot pie! 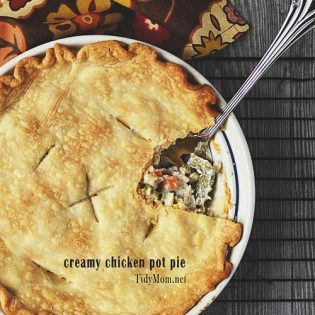 I do beleive that we will be having creamy chicken pot pie for dinner tonight, thanks for the great idea and receipe! Oh my! This is truly fall comfort food at its finest! I was just thinking about making a pot pie! Can’t wait to try it with the cooking creme! I’m all about an easy dinner and this is one BEAUTIFUL [& easy] dinner, perfect for busy families! This looks great! Easy for me to cook for the kids. Cheryl this pot pie is gorgeous! Such a far cry from the pot pies of my upbringing. It really feels like fall. Now that is an easy recipe – I’ve never seen the cooking creme you used, but it sounds like some magic cream sauce! I do love a good chicken pot pie! This looks so simple and so yummy! I’ve seen the cooking cream so many times at the market and I always pass it right up. Next time, I’ll definitely pick one up because this looks fantastic. you know i’ll be trying this with that cream sauce. my fave, thanks to you sharing it! What a yummy way to celebrate Fall’s arrival! 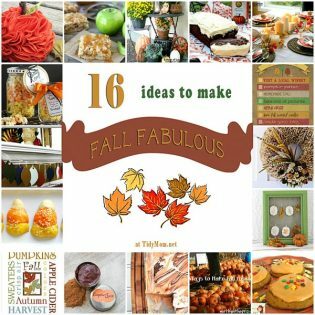 One of our all time favorite fall recipes!! Totally loving this! As a kid, I was utterly obsessed with those frozen Banquet chicken pot pies and ate them more times a week than I’d care to admit. I love them so! This homemade version looks amazing, and I love that you used cookie creme. Totally rich and delish! My daughter asked me this week if I could make chicken pot pie. AND she also noticed the Kraft cooking cremes while we were grocery shopping yesterday. Your pot pie looks delicious. AND it sounds like I have no excuse not to make it! Been craving this since seeing on pinterest earlier this week. YUM! Oh my word, I’m with Amy. Ever since I saw this on pinterest this week it has been haunting my dreams. Gorgeous! I really should try making another pot pie. I made one years ago and haven’t since. This was our supper tonight and we all loved it. Even my 6 year old, who is vegetable resistant gave it a thumbs up. Of course we had to explain that yes, these are soup vegetables, just not in a broth but a creme! You just made my day! There is nothing better on a cool, wet, rainy day than some comfort food. My husband and I love Pot Pie’s, but don’t indulge often because I’m diabetic, but when we throw caution to the wind we love a good Pot Pie. This one looks so easy, sounds so tasty, and will be very pleasing to my husband. I believe this is a win, win, win situation. I love your page and plan to visit quite often. 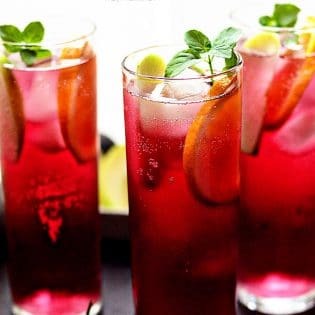 Is there anyone who has actually made this recipe? I ask because I am always looking for the perfect pot pie. The crust on this is beautiful, but it does not LOOK creamy; it looks dry. Please, someone tell me if the picture betrays its creaminess. I made it and my family devoured it shortly after taking the picture! It wasn’t dry at all! Thanks for your reply. I’ll give it a go and get back with you! How did you make it recently when they have stopped making the cooking creams? I know it is from 2012 but I was referring to your response from last week (above) where you said you made it and your kids gobbled it up. Did you substitute for the cooking cream?